Trump Makes "Pocahontas" Joke At White House Event Honoring Elderly WWII Navajo Code Talkers [VIDEO] - Joe.My.God. 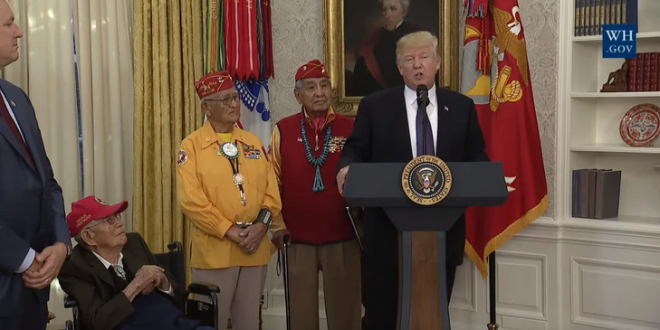 Trump just attacked Elizabeth Warren as “Pocahontas” at a White House event honoring the elderly surviving members of the Navajo Code Talkers, who were recruited by the Marine Corps during World War II to deliver messages that the Japanese were unable to translate. “You were here long before any of us were here. Although we have a representative in Congress who they say was here a long time ago. They call her Pocahontas,” Trump said. His comments were met by total silence.